This is a copy of an article written by Emrys Williams for About Eversholt published in August 2017. I’ve been making a map of the monuments in Eversholt Churchyard, my contribution to a project to survey them all again. Nothing high tech; I’ve been making a pilgrimage round the churchyard on my knees, with a tape measure and a clipboard. A foolscap clipboard, just to emphasise the aged technology. It’s taken quite a lot of time, but it’s been a lovely time, a quiet time for reflection in a peaceful and sometimes beautiful place. I’ve not been reading the inscriptions, that’s someone else’s job, but I couldn’t help noticing some. Every one one of those people was loved and their loss was mourned. Back home, I’ve been looking at the burial records. We’ve had the church burials register for 1602-1812 online for some time (you can find it, and the map so far, at village.eversholt.org.uk). Much of that register is incomplete or unreliable, rectors being more concerned with the welfare of the living than the bureaucracy of the dead, but the period 1795-1805 stands out as well-documented. About 15 people a year were buried, and about a third of those were children. About one third of children died while still young enough to be labelled “infant”. And that wasn’t out of the ordinary. As late as 1880, 30% of children in Eversholt died before their 5th birthday, and that was regarded as nothing unusual. 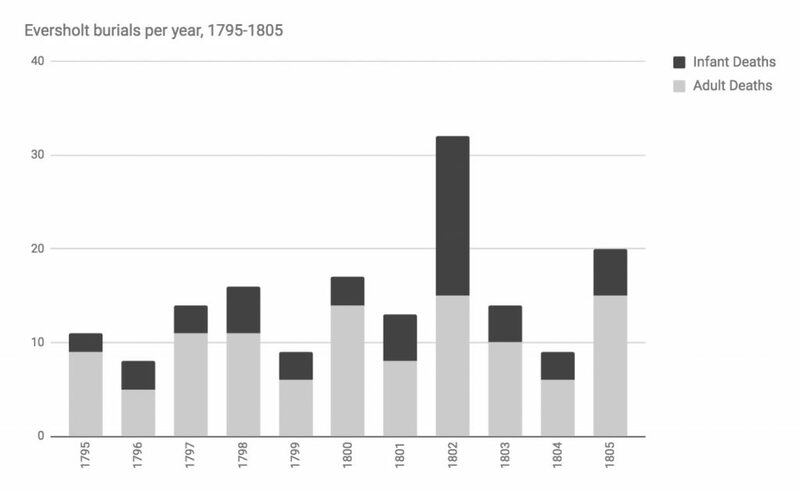 On average, there should have been 10 adults and 5 children buried in 1802. Bad enough, but, in fact, there were 15 adults and 18 children. That’s more than three times the “expected” number of dead children. Even when people were used to losing children, 1802 must have been a horrible year. Yet, there is no hint of what was actually going on. Not one of those children has a monument in the churchyard. There is nothing in the burials register to explain the spike. There is nothing in the local papers to suggest anything unusual. There must have been some shock, an ordeal, perhaps an epidemic, but even the loss of all those children was not enough to cause anyone to write down an explanation that has endured. Yet every one was loved and mourned. Here they are, our lost children of 1802: Elizabeth Valentine, Sarah Sudbury, George Osborne, Hannah Chance, Mary Read, Mary Cook, Elizabeth Stapleton, Ann Rogers, John Day, Elizabeth Goodwin, Susanna Reddall, William Chance, Mary Smith, John Bunker, Sarah Savage, Charlotte Perry, John Horsler, William Horsler. I can’t imagine what we’d feel if we had to bury 18 children in one year now in Eversholt, it’s unthinkable. I’ve loved my time in the churchyard, mapping graves, surveying mortality. Let’s count our blessings while we still have them. Comments? Do you know what happened? Please get in touch.